In 2010 the Australian Government introduced changes to its General Skilled Migration (GSM) Program, which have had a big impact on the eligibility of people living overseas to come to Australia as a skilled migrant as well as on the eligibility of international students to apply for permanent residence on completion of their studies in Australia. Many other changes have been introduced since then, which were consolidated into the new Skilled Migration Selection Model (SkillSelect) on 1 July 2012. In April 2017 the socalled "Skilled Occupation List (SOL)" was significantly revised: it was divided into a Medium and Long-term Strategic Skills List (MLTSSL) and a Short-term Skilled Occupation List (STSOL), both of which can be viewed on the Department of Immigration website as the Combined List of Eligible Skilled Occupations. 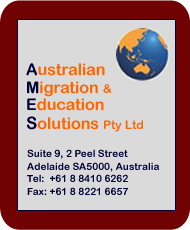 This list is the primary and most important factor governing your eligibility to migrate to Australia, unless you are being sponsored by an employerEmployer-sponsored skilled migrants are given the highest priority at the present time . We suggest that you view and/or print the Combined List of Eligible Skilled Occupations, which is still being referred to as the "Skilled Occupations List", to see if your occupation is included. Skilled Nominated or Sponsored (Provisional) Visa (subclass 489)This is a TEMPORARY (or "PROVISIONAL") visa which leads to a Permanent visa. It has the same Points Test pass mark as the Skilled Sponsored Visa, but the pass mark is easier to reach. It then gives you 3 years to meet the requirements for a permanent visa which will not be Points-Tested. You must be sponsored by an eligible relative living in Australia or obtain nomination from a participating State or Territory government agency. Click for details. you must achieve a particular minimum pass mark in the Points Test. All these requirements (and some other aspects of your background) contribute to your score on the Points Test and this score determines which of the three Skilled Visas you can apply for. So, once you've ascertained that your occupation is on the current SOL, your next step would be to work out what your Points Test Pass Mark is likely to be. you have to submit a correct, properly completed and fully documented application. Your application will be assessed by a public servant who is typically under a lot of pressure: the quickest way for them to get the job done is to find something wrong with the nature of your application. This is where professional representation can play a crucial role and where the help and advice of a Registered Migration Agent can be a real advantage. Australia currently has a Special Skilled Visa for EngineersIf you graduated as an Engineer in the last 2 years, this visa gives you some important advantages, including not having to do the Points Test. However, there are special conditions. Click to check the details. which is intended to combat the shortage of Engineering skills in the resource sector and which makes it relatively easy for recently graduated Engineers to come to Australia to work and settle.